So in MT4 you created profiles with one currency against other currencies? Like CHF against 7 other majors, AUD against 7 other majors? So every morning you scan through 8 profiles with 7 charts? Occasionally a particular currency will highlight anomalies, inconsistencies or contradictory behaviour with perhaps one specific pairing for any number of reasons which, in that type of visual presentation, illuminates such scenarios quickly & clearly. What are you looking for (could you post some example) and in what time? Only before London open or NY open? Or every hour/4h? It’s exactly the same procedure when scanning & identifying potential set ups across 30 odd permutations as it is on the half dozen majors. You can even toss in assorted commodity instruments & the indices if you’re really feeling adventurous. What are you looking for and in what time? What do you [B]think[/B] you’re looking for when usually tracking a potential 3 Ducks entry? I was thinking and I suppose I would not be able to do it. Now I have 3 screens x 5 non-correlated instruments which I watch every hour to see 3 dux setups. I do around 10 trades a day. I am thinking of reducing to 10 instruments. I cannot do 30 charts every hour. Thanks! 10 trades a day seems a lot, I normally average 2 or 3 a week. Depends on how many instruments you observe. If you don’t get up early before Frankfurt all ADR is gone already on USD NOK after London open. Euro is a good bet this week v/s a host of takers including nzd, cad, aud or gbp. All those pairs are pushing hard against their average weekly ranges into today’s new york close, so if you’re day trading them a pullback would be especially welcome for a continuation into the weekend. Ftse & Nasdaq made the list again this week too & still rank as decent opportunities into the next 3 days. Just dropping in to say thanks Andy for the ebook. Long time fan of the thread. Impressive effort keeping up such a long thread. Nice comments! You’re more than welcome Noobstation, glad you got the eBook. Credit has to go to BabyPips for supporting the thread and most importantly, all the contributors (past and present) who’ve posted charts, trades, questions, answers and ideas, I’m humbled! [B]SL FOR HIGHER FRAMES[/B]: Captain, your default stop loss for the D1,[U] H4[/U], M5 combo is 30 pips. Seems like that’s comparable to trading the H4. Am I correct? Anyhow, if I were to trade a combo like W1,[U] D1[/U], H4, what would be the best way to determine the comparable stop loss? Seems like it should be in proportion to the ATRs. For example, if the ATR on the H4 of a pair is 25, and the ATR on the D1 (for the higher combo) for the same pair is 75, the ATR on the D1 is 3 times the ATR on the H4. Therefore, it seems, to get the comparable stop for the higher combo, I’d multiply 30 pips by 3, which would be a 90 pip stop loss for the D1. Make sense? Is there a better way? [B]INDICATOR[/B]: Can anyone direct me to an indicator that would show the relation of price to the 60 SMA for the three frames of a 3-time-frame-combo simultaneously, on the same frame, so I wouldn’t have to keep flipping from frame to frame (for multiple pairs)? Preferably one with visuals as opposed to simply text? If it’s an EA that has that feature, but one where I could turn off the auto trade function, that would be cool, too. [B]INDICATOR[/B]: Can anyone direct me to an indicator that would show the relation of price to the 60 SMA for the three frames of a 3-time-frame-combo simultaneously, on the same frame, so I wouldn’t have to keep flipping from frame to frame (for multiple pairs)? Preferably one with visuals as opposed to simply text? Check POST #6 and POST #7 in this thread for an answer to this question. The method suggested in post #6 works for the H4-H1-m5 trio of TF’s. For W1-D1-H4, use 60 SMA, 360 SMA, and 1800 SMA on the H4 chart. 3 Ducks is clearly a 3-step methodology. 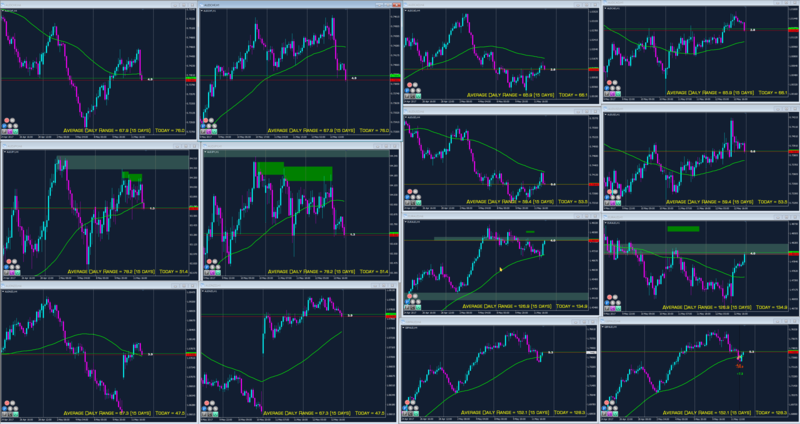 Step 1: Use your highest TF to find the pairs that are exhibiting trade-able trends, and therefore [I][B]may be[/B][/I] good prospects for trading at this time. For each pair looked at, it’s a binary decision: GO or NO GO. If a pair passes this test, then it’s on to the intermediate TF for a closer look at that pair. Step 2: Use your intermediate TF to see whether the intermediate wave is in sych with the major wave (the trend) as revealed on the highest TF. If the waves are in synch, then you’ve found a [I][B]probable[/B][/I] trade. So, then it’s on to the lowest TF for an intimate look at that pair. Step 3. Use your lowest TF to catch a favorable entry point. These steps should be done separately, sequentially and in isolation from one another. Trying to accomplish three different analyses in one step is probably a mistake. I’ll leave your first question for someone else to answer. The concept implied in post 6 is clear: The ratios between the 3 SMAs are the same as those between the three time frames, but it took me a while to see how you came up with 1800 in W1 ( “For W1-D1-H4, use 60 SMA, 360 SMA, and 1800 SMA on the H4 chart”) until I realized that W1 represents 5, not 7, days for the forex week. There are 30 H4s in a forex week. 30 X 60 = 1800. Bravo! Having said all of that, that still leaves the matter of the ATR readings not being in sync with the time frame ratios, which seems to be in conflict the assumption above, that the SMAs should be in sync with the time ratios. There are 12 M5s in an H1, but the ATRs are not in the ratio of 1:12. 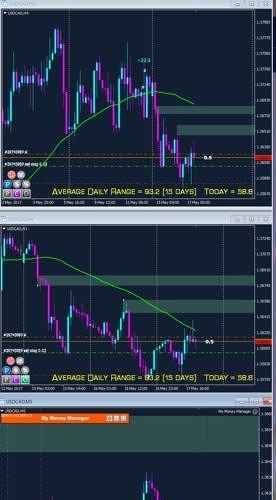 At this moment, for EURUSD, the ATR on M5 is 0.00024, but the ATR for H1 is 0.00150, which are in the ratio of 1:6.25, not 1:12. This, of course, leads to the question: Should the SMAs be in sync with the ATR ratios or with the time frame ratios? If you’d like to field this, that would be great; but if you’d like others to deal with this as per your above response, that’s cool, too. As to the matter of Andy’s 3-step method, your point is well taken. Once I determine that price is on the same of the 60 SMA on the 3 frames (no matter how I determine it), I do intend to inspect each frame separately in keeping with each frame’s purpose.
. . . stop-loss at the last low and the target at the highs. That quote is from page 2 of this forum. You recommend we exit a buy trade when price drops below the MA, yet you put your stop way below the MA in your illustration. If I were to monitor my trade so I could exit when price drops below the MA, then wouldn’t you say I should put my stop much closer to the MA than way below it? Does anybody know why Andy is only monitoring 6 currency pairs? Not gold or oil or nice trending EUR or GBP vs commodity currencies?